Some people respond to rivalries in their own ways, some ignoring them others feeding into the intensity. 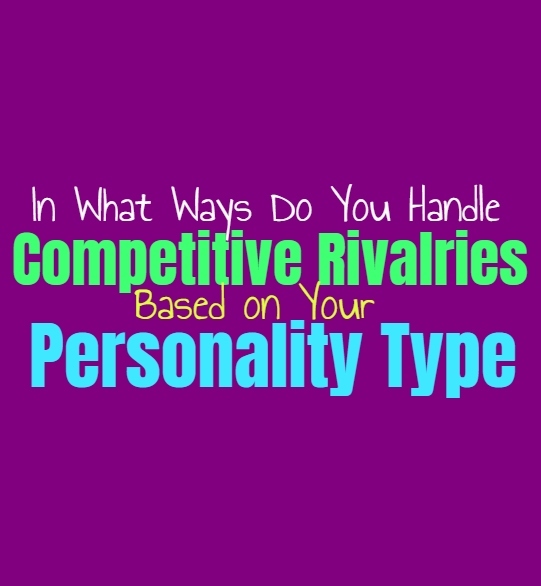 Here is how you cope with or handle rivalries, based on your personality type. INFJs aren’t usually fans of having to maintain competitive rivalries, even if they are intended to be playful. For them this whole idea can feel a bit immature and draining, and not at all rewarding. Some INFJs might get into for the sake of their loved ones, and they do enjoy being able to interact with them in different ways. They can certainly find themselves getting into competitive rivalries in a playful manner, but only for the sake of someone else, since to them this can be a very unappealing. ENFJs enjoy being able to experience things with their loved ones and they can be a bit competitive sometimes. As long as these competitive rivalries aren’t sincerely going to make enemies, then they will enjoy taking part in them most of the time. ENFJs like to do things for those they love and so if the people around them are interested in things like sports rivalries, then they will certainly get into them as well. For the ENFJ it is about spending time with others and being able to engage in a little competition. INFPs usually aren’t fans of competitive rivalries, especially relating to things like sports. They can sometimes find themselves excited about these things with the right person, but most of the time they can be rather repulsed by the idea. People getting drawn to something which seems a bit shallow for the INFP, is not really something they are going to be interested in. They might even be the person mocking these types of rivalries, finding ways to really make fun of how foolish they seem. ENFPs can sometimes getting into competitive rivalries, simply for the fun of the experience. They will especially enjoy this if they are doing it with someone they love and are close to. They do like being able to interact with others and sometimes that is all competition is about for them. ENFPs do like being able to challenge themselves, and their passionate natures are often what helps to inspire them when it comes to being competitive. INTJs don’t mind a little competition in their lives and so a little competitive rivalry can be enjoyable for them. INTJs are naturally competitive people and so the chance to do this in a more intense setting can actually be something they are entertained by. They are especially drawn to this in the things they are most passionate about, and don’t mind that their competitive nature might be a bit too much for others to handle. For the INTJ it is about knowing how to push themselves and always search for ways to improve. ENTJs do enjoy competition and so for them a competitive rivalry can be exciting and entertaining. For the ENTJ these are often ways to blow off some steam and figure out how far they can push themselves. They do sometimes enjoy things like sports rivalries, or really any competitive setting in which they are truly passionate about. For the ENTJ it is enjoyable to challenge themselves and see just how far they can go with something. They do focus on winning but that doesn’t mean they won’t enjoy the experience. For the INTP some competitive rivalries can feel a bit foolish and draining, but if it is something they are passionate about they can get a bit competitive themselves. When they find a hobby they are excited about then INTPs don’t mind getting into a bit of a competitive rivalry with others. They enjoy being able to use their minds and analysis in order to figure out how they can become superior in these situations. Learning how to beat others in these rivalries can actually be a fun challenge for the INTP. ENTPs are often competitive people and so they might enjoy participating in some competitive rivalries. They enjoy being able to challenge themselves and see just how far they can take something. For the ENTP a competitive rivalry can actually be really thrilling, and help them connect with others, as well as different parts of themselves. They don’t mind when things get a bit heated, they actually prefer this type of passion and intensity. ISTJs don’t mind a bit of competition, since they do have a tendency to push themselves to always be the best at things. For the ISTJ a competitive rivalry can actually be a really fun way to blow off some steam. They work hard and so they need things to relax and different hobbies which excite them. Sometimes a competitive rivalry is a great way for them to interact with others and make connections with people. ESTJs are highly competitive people and so participating in a competitive rivalry is certainly something they will enjoy. They often like being able to find hobbies which are a bit more competitive and will enjoy when things get a bit heated. ESTJs don’t mind the competitive, they actually thrive in these types of settings. They push themselves to always be improving and will certainly take on the challenge willingly. ISFJs don’t mind being a bit competitive as long as it is done in a fun manner. For them certain competitive rivalries are enjoyable, and a good way to blow off a little steam. While they are compassionate people who want to be able to take care of their loved ones, that doesn’t mean they are afraid of competition. Most ISFJs enjoy these types of rivalries since it actually brings people together and gives them a chance to have some fun as a group. ESFJs don’t mind competitive rivalries as long as it is connected to something they are passionate about. They might become annoyed with some of these rivalries, especially if it is something they find boring or pointless. When the ESFJ is passionate about something they enjoy being a little competitive and being able to prove themselves in these situations. They are perfectionists and so they do have a competitive side sometimes. ISTPs might enjoy a competitive rivalry since it does shake things up a bit. They enjoy getting into the heat of the moment and being able to experience something thrilling. They might not want to maintain this for a long time if they do become bored with the hobby itself, but for a while it can be exciting for the ISTP. Some ISTPs might be drawn to sports rivalries and enjoy being able to root for their team in a very competitive manner. ESTPs do enjoy a good competitive rivalry, especially when they get to connect with loved ones over it. Having something they can root for and really get excited about is certainly entertaining for the ESTP. They enjoy being able to bring their loved ones into this hobby, and often find themselves enjoying the time spent with others, even if they are competing against them in these rivalries. ISFPs might become bored with certain competitive rivalries, especially if it seems a bit too heated. They don’t mind a bit of competition but can become bored when the situation just feels a bit foolish and overboard. ISFPs will be more drawn to these rivalries if it is tied to something they are personally passionate about, but they do find themselves bored of them fairly easily. They bounce around to different things and don’t want to feel stuck locked in some sort of continuous rivalry. ESFPs might actually enjoy a good sports rivalry, just because it is a thrilling and entertaining way to connect with others. For the ESFP it really isn’t about winning, so much as being around others and having a good time. Anything which is both passionate and exciting is something the ESFP is going to be drawn to. For them competition like this is just a fun way to spark some interaction with the people they care for.